Contrary to what you see in Roland Emmerich movies, hypothermia can set in if you spend too much time doing heavy work outside during the winter. If someone you know comes down with a case of hypothermia, get them help and use this chart to treat them in the meantime. 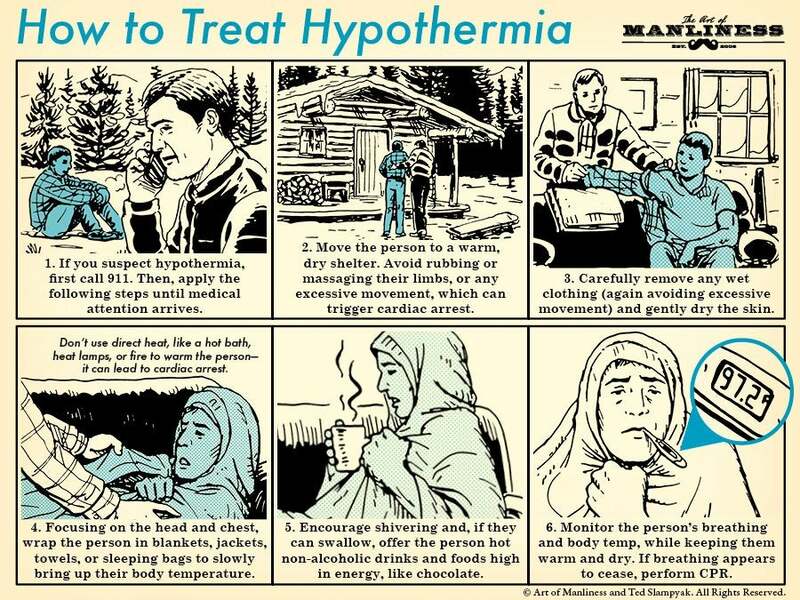 The graphic below, from advice site The Art of Manliness, walks through the basic steps of helping someone manage hypothermia. The key step: get professional medical help. If you spot hypothermia — you can read a list of symptoms at the Mayo Clinic here — call emergency services immediately. While you wait, take the person somewhere warm and wrap them in blankets. Remove anything wet they might be wearing. Give them warm drinks and foods that are high in energy (like chocolate). The biggest risk of hypothermia is cardiac arrest. Avoid using direct heat or friction to warm them, as this can trigger a cardiac event. Finally, monitor the person's breathing and body temperature until help arrives. Ummm isn't a 'hot drink' a method of DIRECT heat? I mean, I can't think of a more DIRECT method of delivering heat to the inside of someone's body.